When it comes to getting me interested in a movie, almost all you have to do is have a giant monster show up. Then you add the amazingly talented Anne Hathaway (who I've been a fan of for years) to the mix? Why, you most assuredly have my money. Well, you would have if Colossal actually played anywhere near me. Grumble, grumble. So I had to wait for the movie to release on DVD to see all of this goodness and inject it right into my veins. Was it worth it? Without getting too spoilery and running some of the great reviews, here it is in a nutshell. Anne Hathaway plays Gloria, a party girl who is out of work and, thanks to coming home mid-morning one too many times, gets kicked out of her apartment by her boyfriend (Dan Stevens) and is forced to move back to the small town she grew up in. There she meets an old friend (Jason Sudeikis) and discovers something strange and wonderful on a drunken walk home through a park. At 8:05 every day, if Gloria stands in a certain part of the park, she can make a monster appear across the world in South Korea and control it. Now Gloria has to figure out what she can do with this power without hurting anyone and sort out her own life in the process. 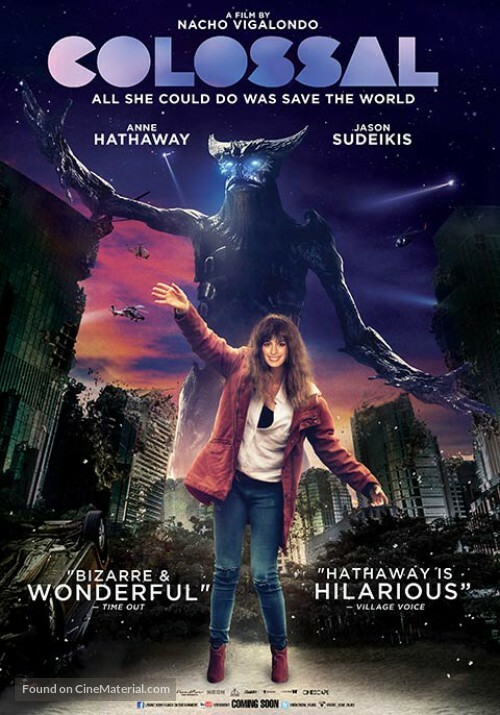 Colossal is simply amazing. I wasn't quite sure what to expect going in, knowing only a bit from the trailer that Gloria can control the monster. Indeed, the whole things starts off much like a standard romantic comedy and then spirals into something completely different that will keep you guessing the entire way. The movie is admittedly light on kaiju action, but what there is of it works like gangbusters, especially the gravity that comes with it in particular scenes. The monster designs are unique and well-realized and I wouldn't mind getting an action figure of it. Hathaway and Sudeikis are at the top of their game here, and the tension mounts and sparks fly when these two get to play off of each other and it is an absolute treat to watch. It may not be on the level of a Kong: Skull Island in terms of kaiju action, but Colossal stands above a lot of those films with wonderful performances and a strong message that resonates with you long after the movie has ended.